Western Watersheds Project (WWP) and Buffalo Field Campaign (BFC) are arranging a workshop for people who want to implement lasting, on-the-ground changes for buffalo and other fish & wildlife. The intention of these efforts is to make the US Forest Service recognize bison as a wildlife species that they must maintain viability for. By law the Forest Service is required to manage their lands for the viability of bison but they have not. Instead, pressured by Livestock industry groups, they manage our most treasured public wildlands for livestock production, a private economic activity that politically precludes the restoration of bison and inflicts significant ecological damage to our public lands, water and wildlife. Brian Ertz and Ken Cole will present a 2-day workshop where people will be taken to nearby grazing allotments and shown the very simple process of documenting damage inflicted on an allotment by livestock grazing. 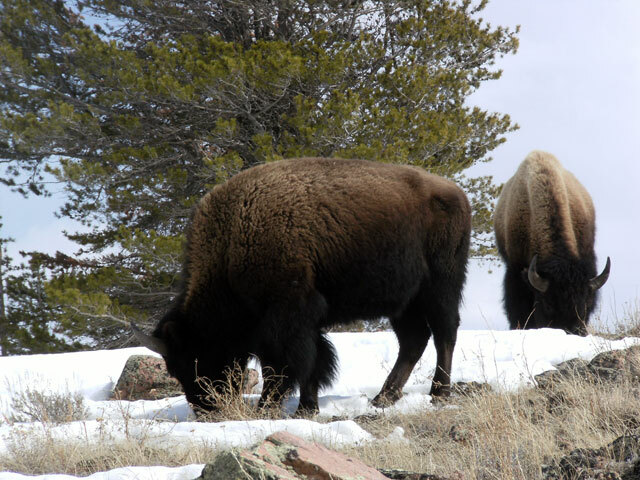 Once documented, we will show how information can be provided to the agency(s) managing the land to provide public managers the opportunity to adjust management in the interest of fish & wildlife – including bison. It would also be coordinated with WWP to follow through with efforts aimed at providing public land and wildlife agencies the legal incentives necessary to provide for bison habitat on our public landscapes. The path to securing meaningful bison habitat on public lands is through ~ not around ~ public land livestock ranching. Help us ensure bison have room to roam. Sounds good. I’d like to go to this but I won’t be out west until the second half of August. Off story..the choice was to relocate or shoot them. Glad they chose the former.